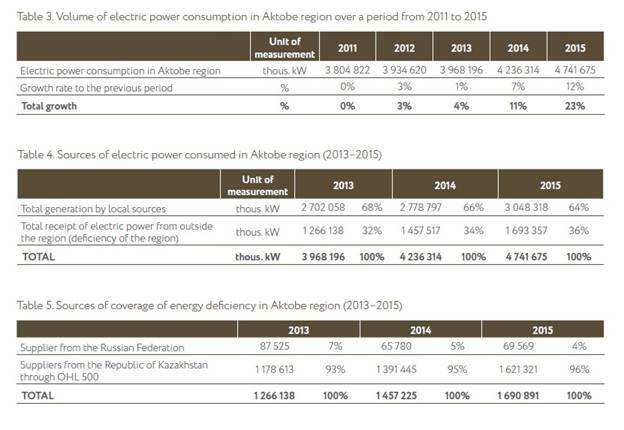 Over a period from 2011 to 2015, Aktobe region increased the electric power consumption by 23%. (Table 3). 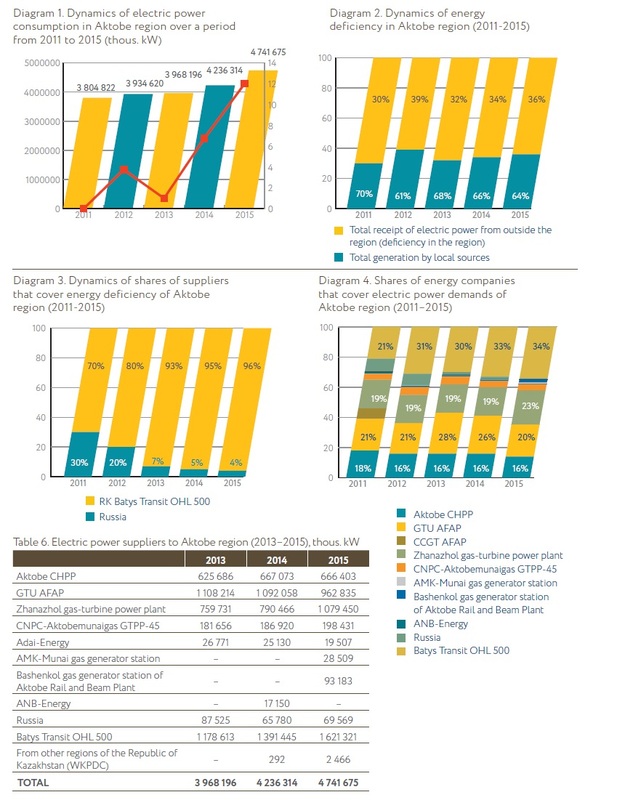 In general, over the last 3 years (2013–2015) a steadily progressive growth rate of electric power consumption was observed in the region (diagram 1). Thus, in 2015, increase in electric power consumption in the region amounted to 12% (4,741,675 thous. kW), while in 2014 (4,236,314 thous. kW) against the level of 2013 (3,934,620 thous. kW) an increase was equal to 7%. In turn, in 2013 and 2012, an increase was equal to 1% and 3% only, respectively. 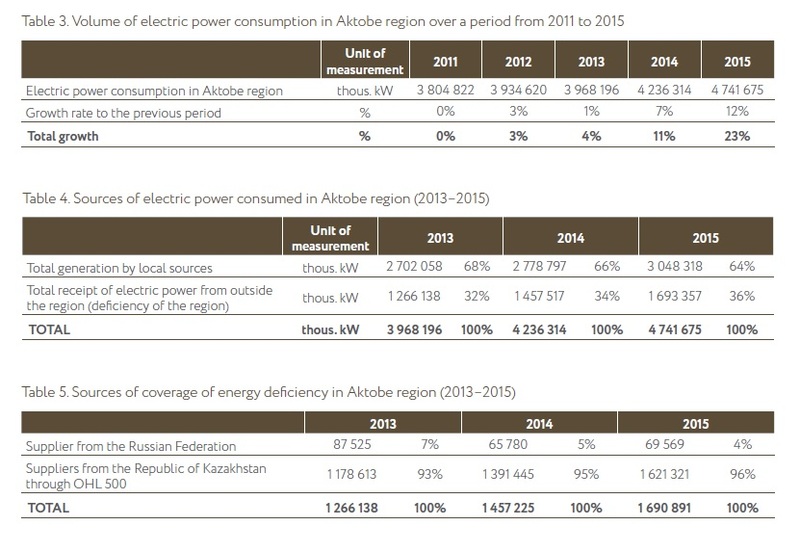 Over the last five years (2011–2015), the energy deficiency situation in Aktobe region remained relatively stable, although there were minor fluctuations (Table 4, diagram 2). Thus, in 2015, the energy deficiency of the region increased by 2% as compared to the previous year and amounted to 36% (1,693,357 thous. kW) of the total energy consumption in the region. 1,457,517 thous. kW, while in 2012 the shortage of electric power was equal to 39% (1,532,458 thous. kW). Over a period from 2011 to 2015, there was a significant increase in a share of local content of electric power transmitted through OHL 500 kV of Batys Transit JSC for coverage of the energy deficiency in Aktobe region (Table 5, diagram 3). Thus, in 2015, a share of the Russian electric power reduced to 4%, while in 2011 and 2012 it was equal to 30% and 20%, respectively. 319,550 thous. kW*h – the Branch «Don Mining and Processing Plant» (subsoil use), the contract No. 14-11/4/5/2871 dated 31.12.2014. 3. KEGOC JSC – to cover the process losses and own needs of Aktobe branch of KEGOC JSC in the amount of 102,325 thous. kW*h, the contract No. 28-Д-1190 dated 22.12.2014. 5. Uralenergo-Pool LLP – in the amount of 6,100 thous. kW*h, the contract No. 11 dated 27.01.2015. 6. Energy Trade Co. LLP – in the amount of 30,215 thous. kW*h, the contract No.1/T dated 26.02.2015. In 2015, the contractual volume of electric power transmission under the above-stated contracts amounted to 2,979,563 thousand kW.h. In 2015, the actual power transmission volume amounted to 1,620,790 thous. KW.h; the deviation was equal to 1,358,773 thous. kW.h or 46%. No. 4 of the branch of Aktobe Ferrous Alloys Plant of Kazchrome TNC JSC. Technological power consumption at the 500 kV power transmission line of Batys Transit JSC takes place during the power transmission process as well as in the course of power consumption by line itself for own needs of substations. In 2015, the actual volume of process energy consumption and coverage of substations’ needs mounted to 81,790 thous. kW.h or 5.05% of the volume of electric power transmitted. In the course of formation, approval and implementation of a tariff and tariff estimates Batys Transit JSC being a natural monopoly entity is governed by the Law of the Republic of Kazakhstan «On Natural Monopolies and Regulated Markets» No. 272-I dated July 9, 1998 and other normative legal acts of the Republic of Kazakhstan. According to the Order No. 102-ОД dated 22.06.2011 of the Aktobe Regional Department of the Agency for Regulation of Natural Monopolies, since August 2011 a tariff for electric power transmission services through OHL 500 kV has been approved for the Company at the rate of 3.45 tenge/kW excluding VAT. This rate was also applicable during the period from January to October 2015.